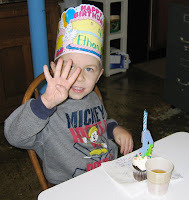 Kirsty Wertz (nee Reid): Ethan Turns Four. 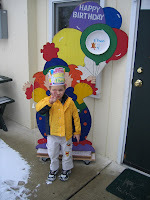 Here's the birthday boy - at his pre-school party this past Friday. And standing out the front of his pre-school showing how old he's turning this year. 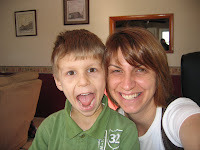 Here's Kyle and me hamming it up for the camera. An AWESOME martini glass that was given to me by RueMel when I left Reynolds. LOVE THIS! Kyle and Sadie in the kitchen. 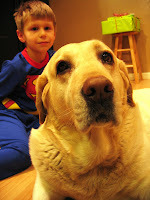 Minutes after this photo was taken, Sadie dropped a deadling stink-bomb and Kyle and I had to evacuate immediately!!! Here's Ethan at pre-school again with the awesome Dinosaur cupcakes that Mike made for his entire class. 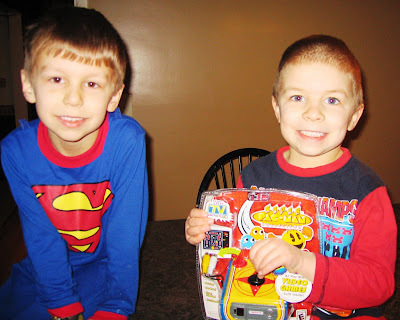 And here's Ethan with the gift that Kyle gave him this morning for his birthday.